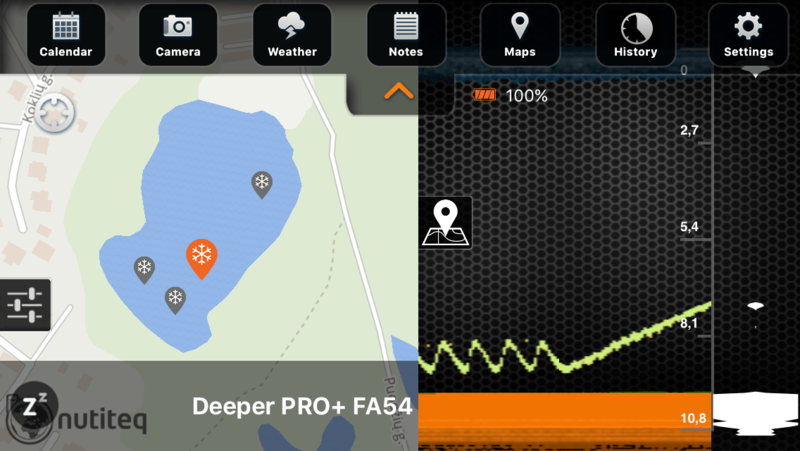 A new iOS upgrade for the Deeper app is now available, and it features an ingenious new feature for ice fishers; GPS Ice Hole Marking.This feature lets you record and save all the ice holes you fish directly onto a map. For each new location you fish, a new spot will be marked on your map. Plus, any data your Deeper picks up at that location will also be stored. So, after a day on the ice, you’ll end up with a detailed record of every hole you fished. The maps and data are available offline. So, you can use them on your next trip to the same location, enabling you to get straight back to the best spots and start landing catches.. The Smart Sonar PRO+ will use its internal GPS for this feature. For the Fishfinder 3.0 and Smart Sonar PRO the app uses your phone’s GPS, so make sure your phone is as close as possible to the hole you’re fishing when you first put the Deeper in; after a couple of seconds your location will be marked and you can move your phone away. And accessing your maps on the Deeper app has been made even more intuitive. Now you can simply click the icon and drag the map across your screen as far as you need. So, you can check out your maps and keep one eye on what’s going on under the water. To get the best out of your Deeper, download the new iOS app upgrade today.